Available at Aldi checkouts across the country are these new Gluten Free berry protein bars from Aldis healthy eating brand of The Foodie Market that measures just over 10cm in length and approx 2.5cm wide. 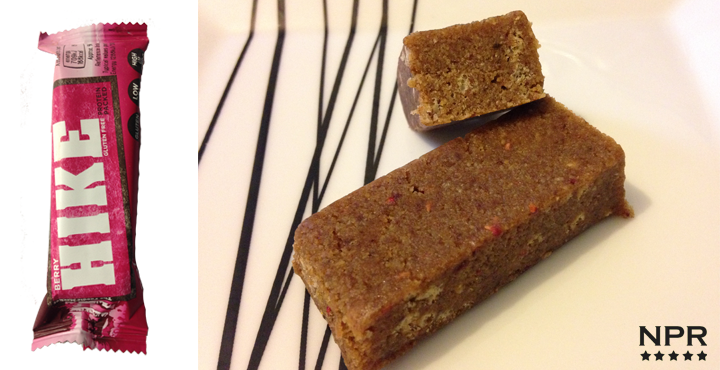 Similar in composition to many other protein bars, this one is made of compacted dates and sprinkled with flavours and ingredients like cereal crispies and berry bits. Straight away you get a strong, sweet (almost Jammie Dodger like) taste and crunchiness(from the crispies) and you almost forget about the date’s texture and tastes until way after the end. It definitely has a strong raspberry taste and really does taste like when you eat the center of a raspberry Jammie Dodger biscuit. This bar is chewy and I’m not sure these little crispie cereal bits are helpful as they get annoying as you chew and chew and they don’t give any extra flavour so… But overall this is a very sweet raspberry bar and semi-enjoyable but it just does not feel healthy at all. I really feel like I have just eaten a lot of sugar and my tastebuds feel like I have just demolished half a pack of Jammie Dodgers, I know I keep saying it but they do taste like that. Anyways, this is a low fat, high carb & protein snack at a cheap price. Its got lots of taste unlike many other similar bars but I just don’t know if I would buy it again, I’m on the fence with it at the moment. I like these. A good size for your back pocket when out cycling, and a nice taste. If you’ve scored it at 82% I don’t understand your reluctance to buy it again? Totally agree! 50p each. I will be buying more this week! They have got rid of them in my stores, I can’t buy them anymore! 😔. I’ve asked aldi why and they say they should be available and to talk to the manager as they need manually ordering after being stopped over Christmas. The manager tried no such luck they are not available to order. So guessing they are discontinued and not even the customer service team know. Enjoy them while you can! Nice tasty nutritional bars! Had 4 this week after training! Defo will buy again at 50p each. Yes, it would be great to get them in say packs of 4 or 5. Good luck with the Ironman. Would be nice to have them in packs perhaps 6, 12 or 24 .I have tried banana one and it taste nice. I like the moist chewiness of these bars, which are comparable with branded protein energy bars. Excellent value. They are easy to eat and swallow whilst on the bike. They contain high protein and natural sugars/carbs from the fruit content. I will be buying more in the future to fuel me on my longer cycle rides. Bought two bars last week, thoroughly satisfying, good taste and chewiness. Kept me and my husband full after long walk. Went back yesterday and bought 12 more in three different flavours. Good price too compared to other protein bars. Well done Aldi!! It has 45g carb/30g sugar and only 19g protein per 100g! WAY too much sugar and too little protein to call it a protein bar! Thank you Sandra, a voice of reason at last! Yep. Agree. I bought some of these without checking. More carbs and sugar than protein. At 19 g protein per 100g and a bar being roughly half of that, it’s roughly 9g of protein per bar which is, erm, poor… They taste like other protein bars but lack the viral ingredient…protein ! Better than a chocolate bar though? I really like them. Not a good bar between meals as need more protein but a good energy bar (lots of carbs) with protein. Make this a 20g protein bar at 75p and I’d buy all day. Yeah, if they could reduce the carbs, especially from sugar, they’d be almost perfect! You don’t really need to kickstart your metabolism as it never really stops else you’d be dead. Plus way too much sugar in these for a breakfast item. Buy some Debbie and Andrew’s 97% sausages and pre-cook them! Had a couple for breakfast this morning before my run. Quite nice tasting, low fat, high protein, and only 50p each. I’ll definitely be buying more. i love these bars. tasty, satisfying, relatively cheap, full of dates – which i wouldn’t normally eat and a reliable source of protein. I can’t fault them and I will be buying more of them. My other protein bars contain whey protein whereas these contain soya protein. Not sure whether that will have the same effect. Soya protein powders seem nowhere near as effective as there whey rivals and are a lot cheaper. You pay for what you get I guess.. I buy this product to maintain energy levels when Hiking and Cycling. Great product and real value for the price. My rating is 5 stars but it only posted 3.1 stars for some reason?